I think I might’ve mentioned once or twice on here (more like a billions times, really) how much I happen to love doughnuts. Just in case you didn’t already know this about me, I love them more than life itself. Cross my heart and kiss my elbow. They’re my all-time favorite dessert/breakfast/treat/midnight snack/reason for living. I don’t really care much for chocolate or ice cream or cookies or cake—I’m totally lying because I still love them all just as much—but doughnuts? Doughnuts are an entirely different story. Doughnuts are my one true passion in life. Doughnuts are my body and soul. I can eat them like no one’s business. Night and day. Day and night. Prepare yourselves if doughnuts are anywhere present and I’m not offered one. I’ll go crazy. Probably flip a table over and destroy everything in sight, like Godzilla. That’s what doughnuts do to me. Just a warning though, if you do offer me one I’ll probably eat them all, without shame, and without so much as a second thought. This year I’ve dropped the ball on the pumpkin recipe game. I’m sorry. It’s not as strong as it has been over the years. Do you remember this delicious Pumpkin Mac and Cheese? Yeah, it’s sort of out of this world. The perfect autumn dinner recipe to blow people’s minds. What about these ridiculously fluffy Pumpkin Chocolate Chip Cookies? Are you having withdrawals yet? Then you should probably make a batch soon. Eating just one isn’t an option. This year however, I kind of forgot how much I love this season and how obsessed I am with pumpkin. It dawned on me the other day that I hadn’t posted a new pumpkin recipe all year. We’re halfway through October already, and there was no pumpkin spice anything to be found. I needed to take care of that right away. 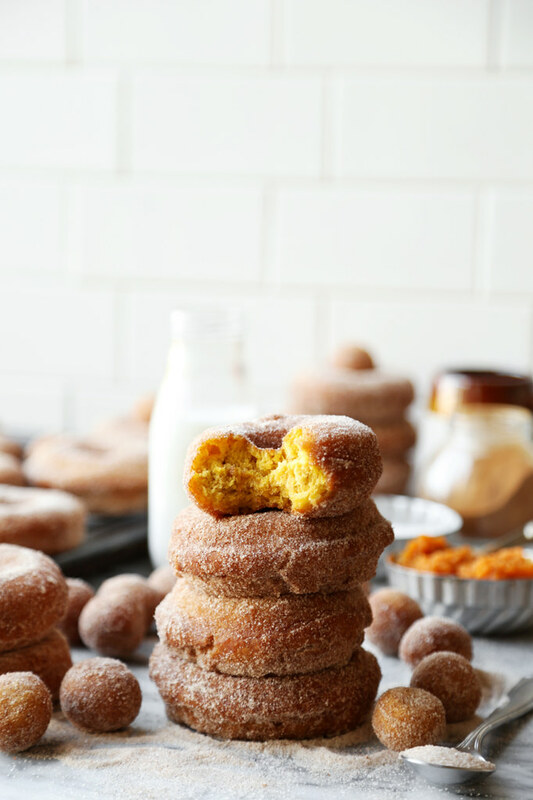 These Pumpkin Cinnamon Sugar Doughnuts sort of combine my three favorites; doughnuts, pumpkin and cinnamon. They’re so perfect I don’t know whether to eat them for breakfast before work, or as a snack in between meals, or even as a tasty dessert after dinner. It’s such a dilemma that the only logical solution I have is to eat them all day long. That way, I don’t have to fret too much about when is the right time to binge on doughnuts. The answer to which is, always. It’s always the right time to shove doughnuts in your face. I hope that’s the one valuable lesson you take away from me. Let’s get back to thinking up new ways to incorporate pumpkin into our lives. I’m not complaining. 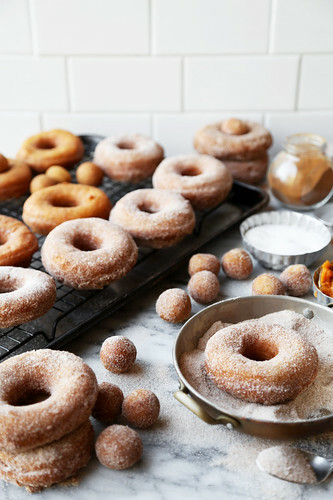 Traditional doughnuts—the fried kind, aka the good kind—sometimes get a bad rap of being too complicated or of taking too much effort. I don’t know who is spreading those evil rumors because doughnuts aren’t all that hard to make. I mean, sure, you have to make a dough and let it rest and cut it out into doughnut shapes and then deep fry them, but all that work just adds so much more to their incredible taste. It’s the experience of making doughnuts that make them really special. We’re going to begin by combining the dry ingredients. 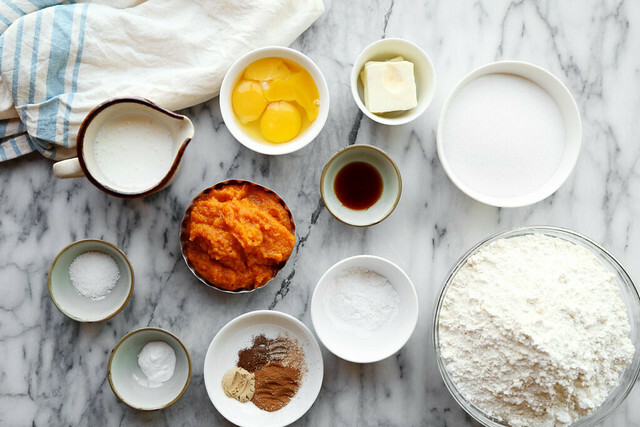 In a large bowl, combine the flour, baking soda, baking powder, salt, and spices. Whisk until evenly combined. You could also just sift everything together, if you’re into that sort of thing. I know there’s this whole technical rule and science behind sifting, but in all honesty I’m too lazy to sift and I haven’t had any major issues not sifting so until then, you’ll catch me not sifting. I’m sorry. Set those dry ingredients to the side. Forget about them for a few minutes. 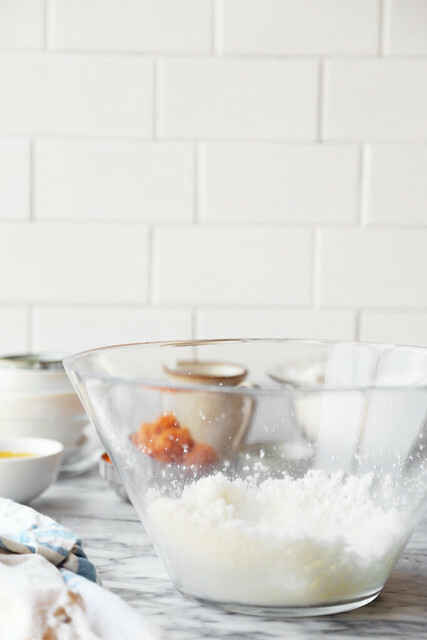 In a separate large bowl, whip together the butter and granulated sugar. Mix until combined. It’ll look crumbly and not creamy at all, but that’s okay. Don’t panic. You’re doing it right. 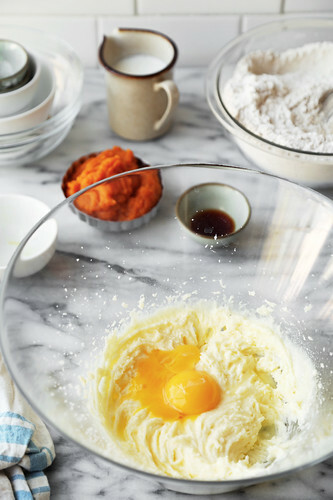 Add the egg and mix, then add the yolks one at a time, mixing well after each addition. Slowly add in the buttermilk, while mixing until combined. Then add the vanilla extract and stir once more. The time has finally come, the moment we’ve all been waiting for. 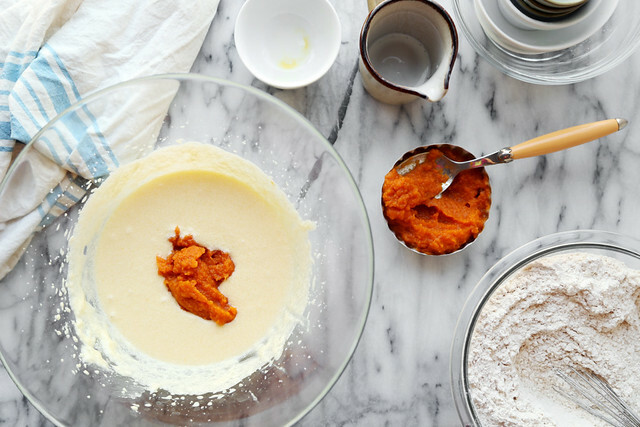 The addition of pumpkin, the ultimate fall ingredient. The star of the show. The big enchilada….or something like that. Anyhow you get the point, just add the pumpkin. 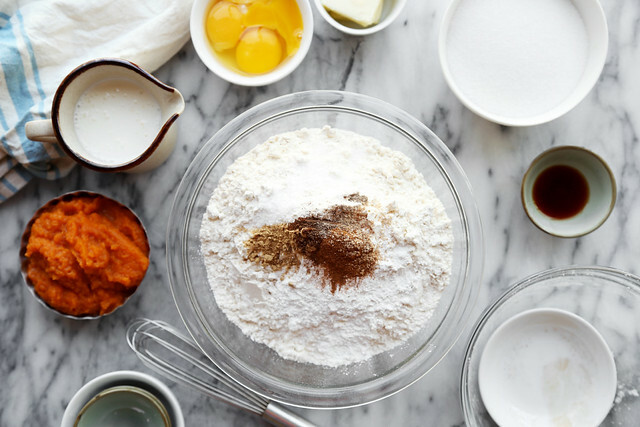 Fold in the flour, using a rubber spatula, making sure you add it in four batches and mixing just until combined. Cover the bowl tightly with plastic wrap and allow to chill in the fridge for at least 3 hours. I know, I know, that sounds like the most torturous three hours of your life. Believe me, no one understands this better than I, but unfortunately that rest time is crucial for fluffy, moist doughnuts. Once chilled, divide the dough in half and roll out each half, separately, on a lightly floured work surface. Roll out into a 1/2 inch thick round or rectangle. Just roll it out. I could tell you a specific shape or size, but the truth is, just roll it out into a thin (semi-thick) flat piece of dough. Cool? Then cut with a 3 inch round cookie cutter and punch out a smaller hole in the center so you end up with doughnuts and doughnut holes. 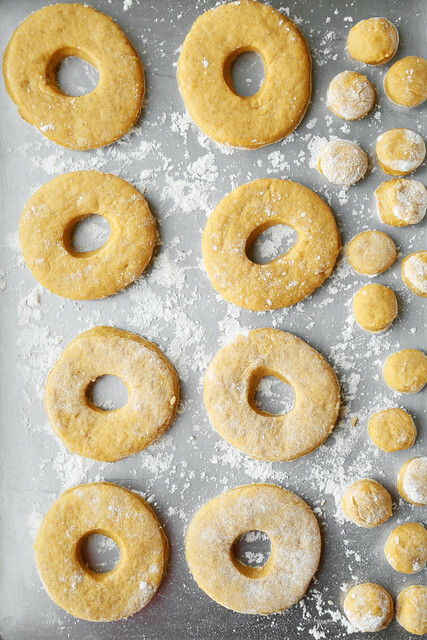 Place the cut out doughnuts and doughnut holes onto a lightly floured baking sheet. The flour, will prevent them from sticking to the pan. You might need two pans. Once the first half of the dough is cut out, roll out the second half. Then squish together all of the scraps and re-roll the dough, punching out the rest of the doughnuts. When you’ve punched out all of the doughnuts and holes, you’re ready to fry them. Heat a large pot filled with vegetable oil, about 2 or 3 inches deep, over medium high heat. Using a slotted spoon, transfer the fried doughnuts to a baking sheet lined with paper towels or paper bags, to catch and soak up all of that excess oil. Continue frying the doughnuts and holes until they’re all fried and ready to go. 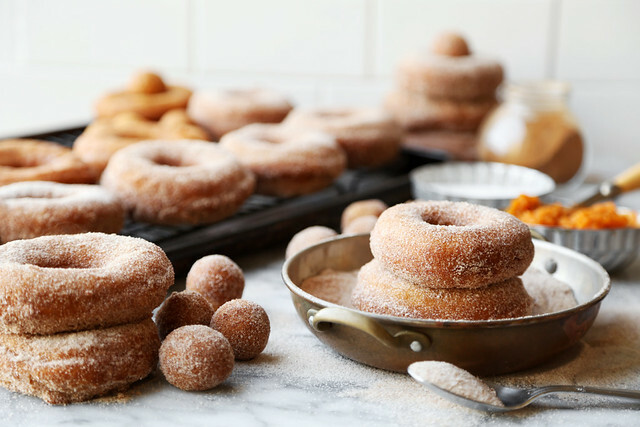 While the doughnuts are still warm, roll them around in a big bowl of cinnamon sugar. (Just granulated sugar mixed with a boatload of ground cinnamon, super easy). If you’re not feeling the cinnamon sugar coating—if you’re looking for something more exciting—then you can totally skip the cinnamon sugar and make a simple vanilla glaze or chocolate ganache for the top. Dip the doughnuts in the glaze or ganache and finish off with sprinkles if you wish. The doughnuts will keep at room temperature, covered tightly with plastic wrap or stored in an airtight container, for up t0 three days! But that’s a ridiculous statement. What am I saying?! Doughnuts will never last three days in someone’s house. Definitely not mine. 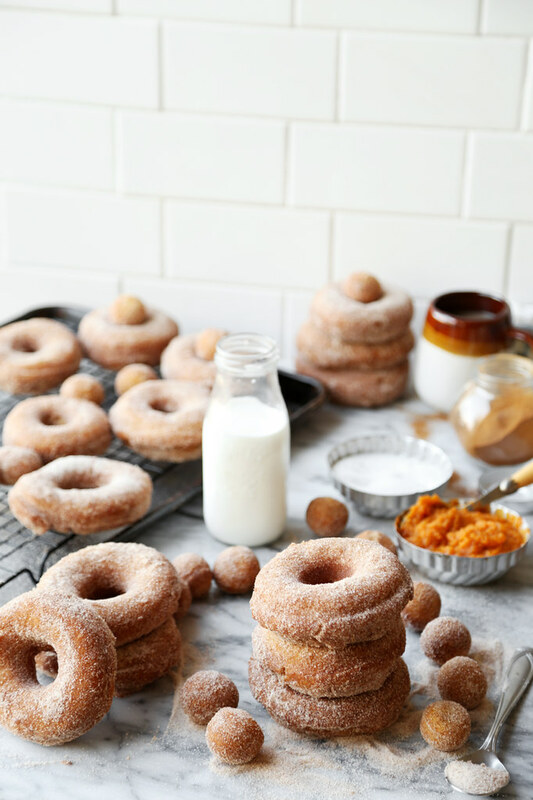 These pumpkin cinnamon sugar doughnuts have become my favorite doughnut. Although I don’t pick favorites when it comes to my favorite dessert/snack/breakfast/treat, but if I did…if someone put a gun to my head and made me choose based on a life or death situation, then I’d choose these. But then again I do have a soft spot for these peanut butter chocolate doughnuts with chopped peanuts. Also, these blueberry crumb doughnuts are the bee’s knees as well! Let’s not forget about the mother of all baked doughnuts, these chocolate salted caramel pretzel doughnuts. Okay, so maybe it’s really hard of a decision for me to make. Don’t judge me. I think it’s worth it to fry doughnuts yourself at home every now and then. I know it seems like a lot of work, but when it comes to doughnuts, nothing is too much work. Nothing. NOTHING I TELL YOU! Fried doughnuts are just not comparable to their baked counterparts. 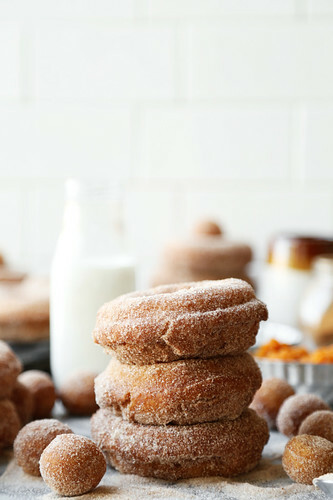 Don’t get me wrong, baked doughnuts are delicious and all (and I’ll never turn my back on them) but somehow, there’s nothing like a warm fresh out of the fryer doughnut rolled around in cinnamon sugar. It reminds me of autumn. The best thing about these cake doughnuts are that you don’t have to deal with the whole ordeal with yeast. There’s no worrying about whether or not you woke up the yeast properly. You don’t even have to go through all of those rising times and steps. This dough just chills once, and then you’re good to go. 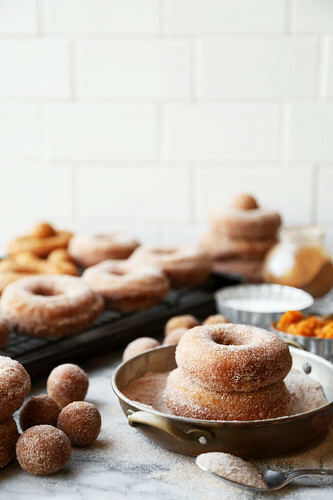 Give these pumpkin cinnamon sugar doughnuts a try this fall. They’re the perfect autumn treat. Enjoy! 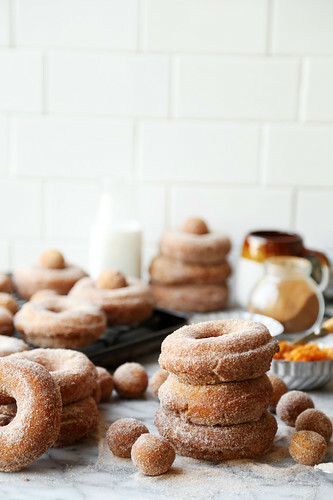 Pumpkin Cinnamon Sugar Doughnuts are the perfect fall treat. An easy to make dough loaded with pumpkin and spices is cut out, fried and rolled in cinnamon sugar. They're irresistibly delicious! 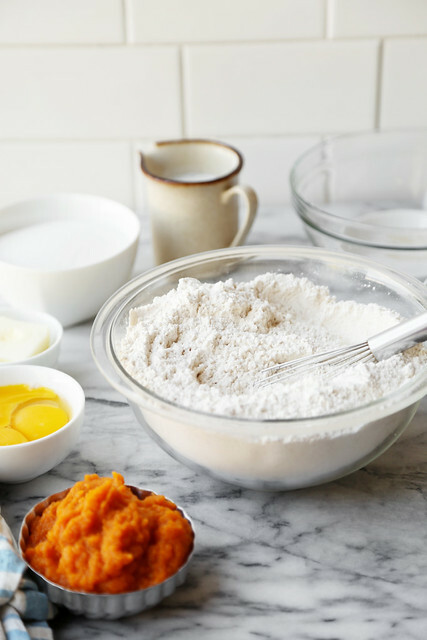 In a large bowl, combine the flour, baking powder, baking soda, salt and spices. Whisk until completely combined. Set aside. In a separate bowl, whip together the butter and granulated sugar for about 5 minutes. It'll be rather lumpy. Add the egg and mix well. Then add the egg yolks, one at a time, mixing well after each addition. Stir in vanilla extract. Slowly pour in the buttermilk, while mixing on medium, until well incorporated. 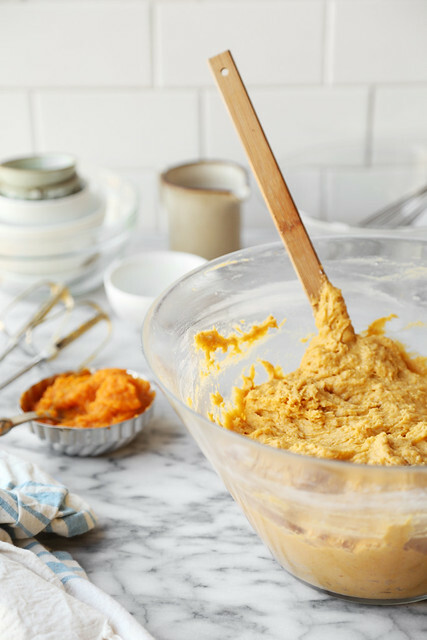 Beat in the pumpkin, making sure to stop the mixer once or twice to scrape down the bottom and sides of the bowl. Gently fold in the dry ingredients in four additions, using a rubber spatula to mix until just incorporated. Do not over-mix or you'll end up with dry tough doughnuts. Cover with plastic wrap and chill for at least 3 hours, or overnight. After it has chilled, divide the dough in half and roll out each half, one at a time on a lightly floured surface about half of an inch thick. 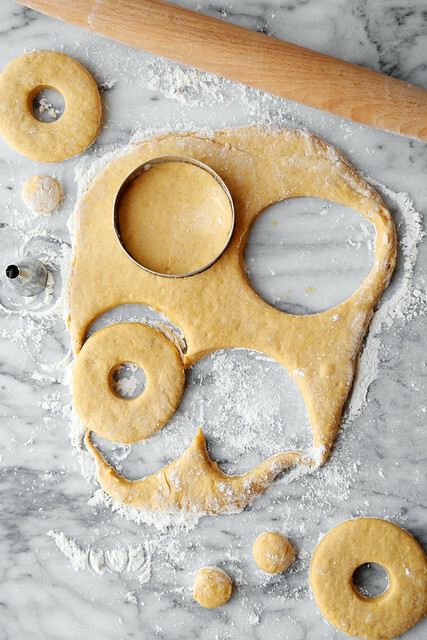 Use a 3 inch round cutter to cut out the doughnuts. Use a smaller circle to punch out the center hole. 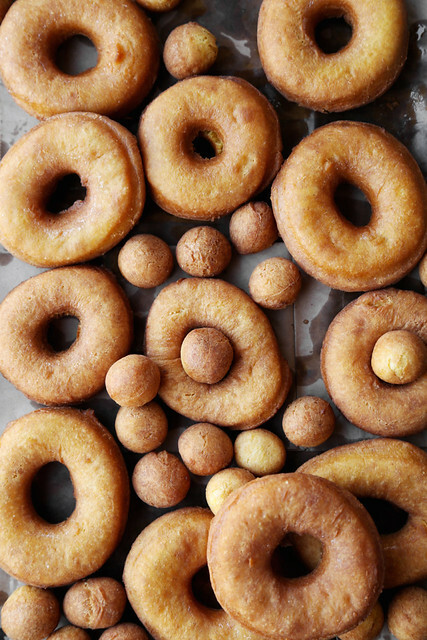 Place the doughnuts and doughnut holes on a lightly floured baking sheet. (You might have to use two baking sheets to fit them all). Roll out the second half and cut out the doughnuts as well. 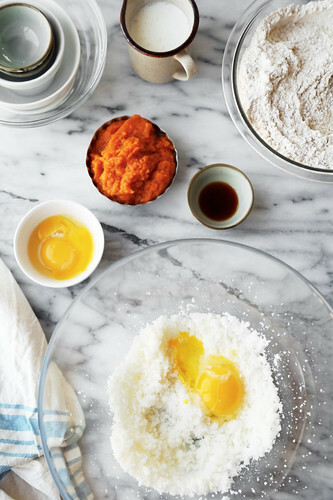 Gather the scraps of dough together and continue to cut out doughnuts until all the dough is used. Heat a deep pot over medium-high heat filled with about 2 to 3 inches of vegetable oil. Use a thermometer to heat the oil to 360°F. 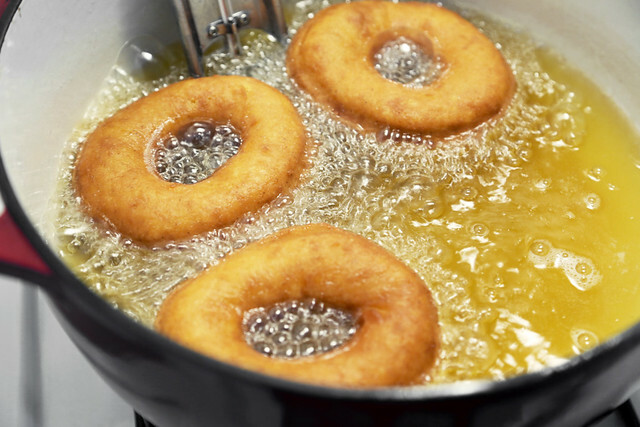 Carefully add the doughnuts and holes to the hot oil, frying a few at a time to not overcrowd the pot. Fry doughnuts and holes a few minutes at a time, flipping to fry the second side, until golden brown. Using a slotted spoon, carefully transfer the fried doughnuts to a baking sheet or plate lined with paper towels. Allow the excess oil to absorb and then transfer to a wire rack placed over a baking sheet. Continue frying the remaining doughnuts. 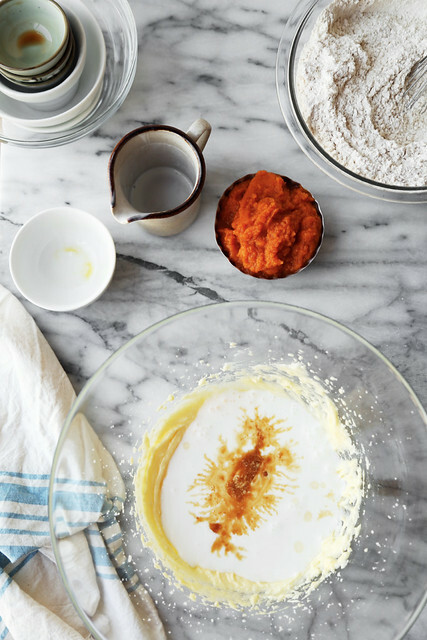 In a medium bowl, whisk together the granulated sugar and cinnamon until evenly combined. 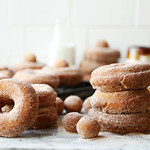 While the doughnuts are still warm, roll them around the cinnamon sugar. Enjoy while warm, or place in an airtight container and store at room temperature for up to 3 days. Enjoy! I must makes these. It brings back memories of my childhood, when my older cousin would make donuts. These sound divine! I really enjoy your blog: the writing, the photography and, of course, the recipes! I always get a smile on my face when your posts land in my inbox and I read them right off the bat. Keep up the good work and I wish you the best! I think these are about to become my favorite donut. No, I KNOW these are about to become my favorite donut. Unreal! 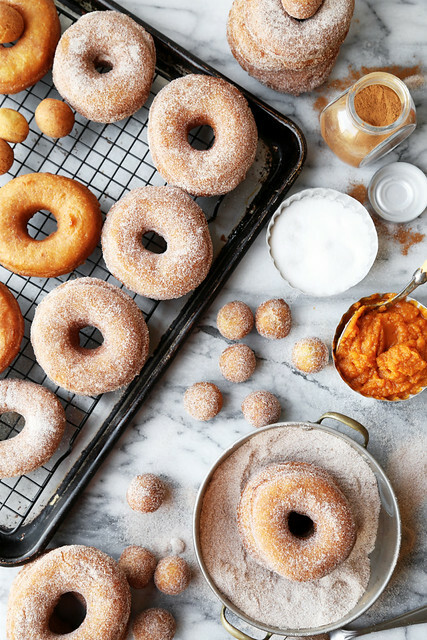 These doughnuts make up for any lack of pumpkin recipes, and them some! I’ve got to make these this weekend! Oh man. I really need these in my life right now. Gorgeous photos…as usual :-). And the perfect way to get back on the pumpkin wagon! I wouldn’t have a problem with that at all! Doughnuts all day long, please! I just tried making these today and the dough was really sticky and hard to roll out. I chilled it for almost 4 hours and still had this problem. Any idea on how I fix this? These doughnuts sound so delicious and I was really looking forward to trying them. 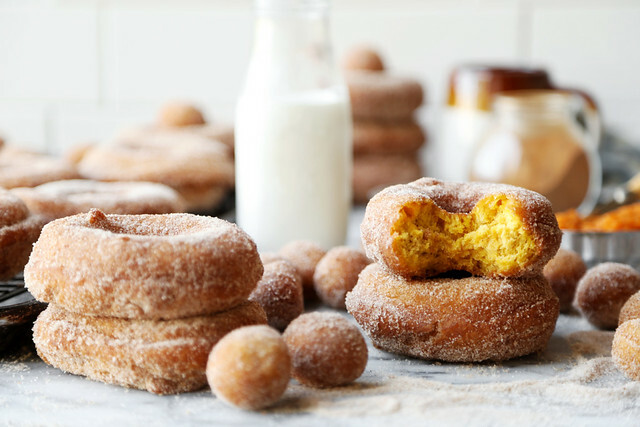 The addition of pumpkin in these donuts makes for a really unique and delicious taste. I really need to try these out for the holidays!